It’s been two weeks since my return from New Zealand. My cubicle is cluttered with bottles of Antipodes water (counterintuitively pronounced an-TIH-puh-dees), my cufflink collection enhanced by a new pair — one cufflink a silhouette of the North Island, the other of the South Island — my DVR set to record every episode of Flight of the Conchords, to which I was introduced by the audio-visual system that I enjoyed during my trans-Pacific flight, flying business class, thank you very much. Look at the seating in business class. That thing actually unfolds into a bed at the press of a button. It’s magic. I could live in Air New Zealand business class. 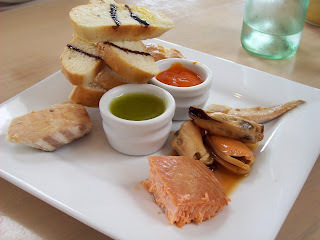 But my trip to New Zealand really ended in Matakana, which from what I can gather was once a little country town and is now a food-oriented getaway for wealthy Aucklanders. There’s a farmer’s market and cute shops with books and knickknacks and art galleries and a high end “butchery” and an organic ice cream shop. You get the idea. We met in the home of Cuisine magazine food editor Lauraine Jacobs, who if she isn’t the doyenne of the greater Auckland culinary scene certainly could be. She hosted a casual luncheon for us, and for her house guests Janie and Gary Hibler — Janie’s a food writer based in the Portland, Ore., area, so Bill already knew her, which is an amusing coincidence — along with Kim Crawford, who makes wines of that name, and some other representatives of New Zealand products, including Wayne Startup from The Village Press, an olive oil company, and Karen Brux from Zespri, the big kiwifruit company. I’d met Karen through IFEC, which isn’t that coincidental or amusing, but indicative of how disconcertingly small the food world is. Also at lunch was Simon Woolley, the founder of Antipodes Water Co.
Kevin had brought along some sausage that a friend in Queenstown had made. Lauraine didn’t like it, but I did. 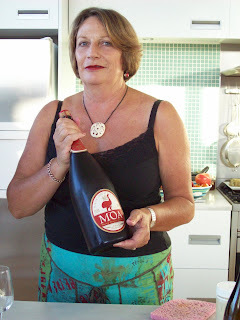 Here’s Lauraine with a big bottle of Moa beer, which we drank along with Kim Crawford’s wine and Simon Woolley’s water. We also sampled Stonecutter Scotch Ale from Renaissance Brewing Co. I mostly ate outside, at a picnic table under a gigantic umbrella, and somehow still managed to get sunburned. That Kiwi sun is murder, I tell you. After lunch, Bill and I were pitched by Wayne, Karen and Simon about olive oil, kiwifruit and water (Kim Crawford left without pitching, apparently content to let the wines speak for themselves). 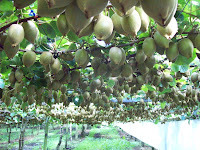 Did you know that Zespri sets prices for farmers based not on the size of the fruit but on its brix content? It seems like such an obvious way to help improve the quality of fruit, but I don't know that anyone else does it. 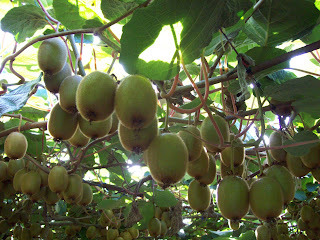 Here's what kiwifruit looks like on the vine. We were supposed to spend the afternoon sailing, but the weather, once again, was inclement, so we repaired to our individual villas, where I updated my blog and took a nap in preparation for dinner, also at the home of the Jacobses. Joining us, along with the Hiblers, was Sam Lewis, director of New Zealand Trade & Enterprise’s food and beverage taskforce, and an extremely interesting guy who spent a bunch of time overseas. I sat between him and Lauraine, and Sam and I had a great chat about life choices and values and stuff — at least I think we did; we drank a lot of New Zealand wine. We must also have spoken about science fiction, as “Iain M. Banks” is written in my notes. And we ate a delicious lamb dish that Lauraine made — a shank marinated with kaffir lime and other things. I told her about Bernie Oliver’s moves to sell the meat of Merino hoggets and she actually shuddered with disgust. Lamb, she insisted, should be served very young and mostly milk-fed. And I must say her lamb was the best I had in New Zealand. I also see in my notes that she likes barrel-aged Sauvignon Blanc, showing that she doesn’t have qualms about going against conventional wisdom. The next day we got up early to meet with Ian Langridge, Jim Dollimore and others at Snells Beach to take a barge to one of their oyster farms. We did this in the wind and rain as New Zealand’s summer continued to elude us. Their specialty, believe it or not, is frozen oysters that they sell on the half-shell. And you know what? They taste like oysters on the half shell. This is a picture of one of their older farms, at which horizontal sticks are laid out within range of the tide. Microscopic young oysters are caught there and grow. From there we met up with Lauraine again at Matakana market, a farmers market that also has prepared food, so I had a Vietnamese steamed dumpling (bahn bao) and a sausage in flat bread with rocket and sweet capsicum sauce (or, in American, arugula and sweet pepper sauce). 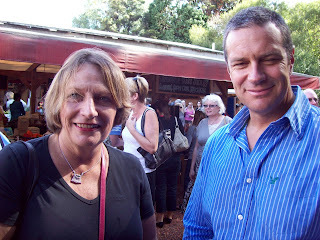 Here are Lauraine and Kevin in the market. Then we wandered around the area, to that fancy book store and butchery I mentioned above, as well as an organic ice cream and sandwich shop called The Blue Ice Cream Cafe. It was the only organic ice cream and sandwich shop I had ever been in that had Eminem playing on its sound system (“Haile’s Song,” but still...). I drank a long black (which is what Antipodeans call a double espresso), and ate a blueberry ice cream cone. We were leaving New Zealand that day, so you’d think we would have been done. But we went on to Brick Bay Wines in Matakana to drink and have a snack and then drove out to a kiwifruit farm to meet Carlos Verissimo, who shared with us information about the high water demands for kiwi fruit and its specific temperature needs (it needs to stay below 7° Celsius for a certain length of time for the fruit to set, but if it gets much below freezing the vines suffer). From there we headed to the airport, so let’s just close this up with another picture of kiwi fruit — this time gold ones. I like wearing a suit on the Lower East Side. It’s sort of like wearing a mohawk in Midtown. It sets you apart, lets you make a statement that you’re comfortable enough in your own skin that you don’t have to look like everyone else. The possible drawback in either case is that you could easily be mistaken for someone involved in the drug trade. My friend Kenyon was performing at The Mercury Lounge on Wednesday, and that’s always bound to be a good time. 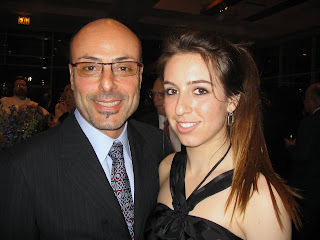 But the annual C-CAP fundraiser was going on across town, at Pier 60 on the Hudson River, honoring chef Alfred Portale, pictured here with his daughter Victoria. So I went from the latter to the former, wearing my black pin-stripe suit, discussing the state of the world with my Pakistani taxi driver (he’s a Clinton supporter, arguing that the Clintons are very much loved overseas and the United States needs to rebuild its global reputation). I actually got to The Mercury Lounge in time to see the very last song by The Dirty Pearls, who were playing to a packed house. Then as I headed to the bar to buy a beer (Brooklyn Lager) a droopy-eyed young man asked me the question with which I started this blog entry. “Nope. Sorry,” I said, and shrugged an apology. “Really?” he said. He seemed half disappointed and half incredulous, as if I were holding out, keeping my cocaine to myself for reasons he didn’t understand. What’s the point of being a drug dealer if you’re not going to sell your cocaine to local fiends? Had I been a drug dealer, he would have had an excellent point. Beer in hand, I went back to watch the performance of A.I., which was opening for Kenyon’s band, Unisex Salon. The lead singer was an old high school friend of Kenyon’s, and I think I would have enjoyed them, but they had all sorts of technical difficulties and had to reboot their computer to run their synthesizer or something. It was sad, because if you’re performing, you have to perform. Your equipment not working is not an excuse. Jump around on the stage and bang pots with a broom handle if you must, but entertain your audience. The band made its way in fits and starts to their last song, and as they played it the lead singer and guitarist sort of wandered off to the back of the stage, apparently uninterested in the very polite and patient audience for which he was playing. So I left the room in the middle of their song — which I think is really rude, but A.I. clearly didn’t care — and got another beer. Kenyon was very, very excited to be performing on stage for the first time with his older brother Stephen, who's a composer and is working with Kenyon to produce his first album, which will be released someday, probably soon. I took some pictures, but I gave Kenyon red eye, so he looks like the devil. Actually, Kenyon would probably like to look like the devil, so, here‘s one of those pictures, on the left. She borrowed my camera and took extremely unflattering pictures of me (it happens; good pictures of me are difficult to take), but a pretty good one of herself (on the right), and also not a bad one of Unisex Salon. Obviously that’s Kenyon in the middle. Brother Stephen is on the left. I had arrived late at the C-CAP benefit, so I didn’t get a chance to eat much, so after Kenyon's show I was thinking of going to Bereket for a doner kebab, but instead went to Philly’s for a cheesesteak. Just for fun: Some FDA guidelines for maximum allowable contaminants in human food, sent from Rachel Laudan to the Association for the Study of Food and Society listserv. Here’s the view from my townhouse. Nice, huh? I left that view so Kevin could drive Bill and me to Leigh Township, where we visited Leigh Fisheries (DBA Lee Fish), which exports wild fin fish, largely caught to order. Who did I run into but Rachel Taulelei, whom I’d met, oh I don’t know, several years ago at one of those New Zealand trade functions. She looked well, as always. Leigh mostly exports snapper, but other things, too, like red snapper, (on the left), blue nose, John Dory, terakihi, big eye and southern blue fin tuna, and hapuka, which English speakers outside of New Zealand call grouper (and which you can see below, or possibly on the right, depending on your Internet browser). All of the fish is sent out unfrozen and 95 percent is exported. 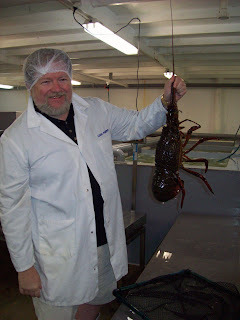 So, we toured the plant and looked at all the fish, and then we were taken to see the giant spiny lobsters, which New Zealanders, for reasons of their own, call crayfish, although gigantic ones like this six-pound puppy that Bill’s holding are called pack horses. They’re a different species from red spiny lobsters and about three-quarters of the price. From there we headed to Black Dog Coffee & Country Kitchen in the heart of Matakana for breakfast, where I had a flat white and a breakfast wrap made with scrambled eggs, spinach and chutney. A word on New Zealand coffee terminology. A short black is an espresso. A long black seems to me to be a double espresso. A flat white is sort of a cross between a macchiato and a latte. A cappuccino is a cappuccino. Australians apparently use the same terminology. Straddling the peninsula that makes up the northern bit of New Zealand’s North Island is the pulsing metropolis of Auckland. The city is home to a full quarter of the country’s population, and apparently the object of scorn and hostility for the other three quarters of New Zealanders, which is pretty much what you would expect. As a New Yorker, I can sympathize. Locals complain about crowds and traffic, but although Auckland is the largest city for more than a thousand miles — until you reach Sydney — it still has just about 1.3 million people. Kevin Parish, Bill King and I arrived there yesterday and immediately headed to the Villa Maria winery, where we met representatives from Family of 12, a coalition of a dozen winemakers that have joined together to market themselves. We met representatives from a few of those wineries and were taken to a large table in a board room where, to my horror, each place setting was appointed with 28 glasses and a spittoon. I’ve said this before and I’ll say it again: I don’t like tasting wine. I like drinking it. Wine is meant to be enjoyed with food — one variety, or possibly on a weird night two, per course at maximum — not to be swirled, smelled, slurped and spit out by the dozen. Now, if you're a winemaker, a sommelier, a beverage consultant, a wine buyer or a wine writer, you have to taste wine. It’s your job. And that’s one reason I'm none of those. Still, I was a guest, and if your hosts want you to taste 28 wines, you taste them. And they did apologize in advance, acknowledging that working through 28 wines was not the ideal way to appreciate them, but what else could they do? Swirling, smelling and slurping are really perfectly fine things to do, but the spitting, oh the spitting. I'm a bad spitter. Sloppy. The wine got caught in my beard. It dripped on my notes. I drenched my napkin wiping my mouth and, to the credit of my hosts, one of them handed me another napkin. It was both nice and deeply humiliating that they were paying attention. Bill later thanked me for drawing their attention away from him, so he could taste in peace. Bill is a great and powerful man. He tried 28 wines without spitting. Or so he claims, and I believe him, even though I think I would have fallen down. After the tasting — first of Sauvignon Blancs, then one Chenin Blanc, and on to Chardonnay, Riesling, nine (9!) Pinot Noirs and finally Bordeaux blends — we chatted, and I picked some of my favorite Pinots and sipped them, actually swallowing. The representatives from Family of 12 said they were going to concentrate on presenting Chardonnay in the United States at the NRA show, since that’s what Americans like. Bill suggested that perhaps they shouldn’t be focusing on such a crowded market, although he admitted that since New Zealand was sort of a blank slate in the minds of American consumers, he wasn’t sure the best way for them to proceed. We both restated the notion that, as a small country, New Zealand should aim for niche markets and charge higher prices. Bill said that for Pinots in particular they should be charging more so that they’ll be taken seriously. From Villa Maria we went to Auckland’s Viaduct Harbor (excuse me, Harbour) for dinner at Soul. Being an American, I expect meals at restaurants in touristy parts of town to be boring at best, but at Soul chef Gareth Stewart’s food was creative and delicious. Of course it didn’t hurt that we were being specially looked after by owner Judith Tabron. Then she sent out three wines per course, and so I take back what I just said about two wines per course being the maximum acceptable number. Three works. Then with my smoked paprika-spiced prawns on grilled watermelon with cucumber and mint relish , Judith gave us two Marlborough Sauvignon Blancs — S. Claire and Brancott — and an Aurum Riesling from Central Otago. Then with my roasted rump and braised shoulder of lamb with garlic confit and slow cooked pukekohe onion, she served three Pinot Noirs — 2006 Te Tera from Martinborough, 2005 Tohu Reserve from Marlborough, and 2006 Bannock Brae from Central Otago. Having drunk six glasses of wine, I didn’t photograph the desserts, which were a lemon tart with raspberry essence, buttermilk sherbet and a bitter chocolate marquis. We also had a Whitestone Moeraki Bay blue cheese from Oamaru (south of Christchurch). We drank a No. 1 Family Estate Cuvée from Marlborough, a Pegasus Bay noble Chardonnay from Waipara, and a Cottage Block noble Riesling from Marlborough. Kevin did not drink with us as he had to drive us to the country town of Matakana, where we were staying at Quest, a collection of townhouses, of which we each got one. So I had a kitchen, a living room, bedroom and two bathrooms. Two televisions, too. This morning Kevin drove us back from the Canterbury high country to Christchurch, and we flew from there to Queenstown, which is arguably the extreme-sport capital of the world. Bungee jumping was invented there, and the place is just lousy with opportunities for sky-diving, jet boating, power skiing and otherwise flinging yourself at nature. I’m guessing at power skiing, but I bet you can do it there. 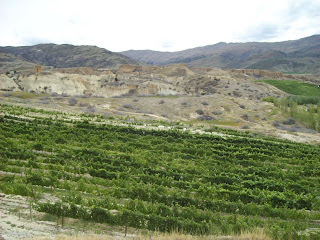 But Queenstown is also in Central Otago, a region that is gaining acclaim for its Pinot Noir. That wouldn't have been possible without the flooding of a canyon to create Lake Dunstan as a source for hydroelectric power. As a concession to locals, they were granted permission to use as much of the water in the lake as they liked for irrigation. That's what Mt. Difficulty winery in Bannockburn has done, and this picture shows the results. See how dry the unirrigated land is compared to the vineyard? Difficult growing conditions are of course terrific for Pinot Noir, so the cold winters and dry summers of Central Otago are great for the stuff. We had lunch at Mt. Difficulty winery — named for a mountain that proved impassable to shepherds seeking greener pastures — with Michael Herrick, of the winery, as well as with pavlova manufacturer Trevor Millar and Andee Gainsford, whose company makes pastries and béchamel sauce for foodservice consumption. After lunch we had separate meetings with Trevor and Andee to learn all about their companies, and then we met Mt. Difficulty winemaker Matt Dicey, who took Bill, Michael Herrick and me down to the cellar for some barrel tastings. Kevin went with us, but I don’t think he drank, as he was driving. This was an ongoing source of consternation for Bill and me, because we wanted to drink with Kevin. Bill, who has lived in Oregon for the past couple of decades and so drinks a lot of Pinot, really loved the wines from the 2007 barrels, but I think I actually prefer the warmer-climate New Zealand Pinots of Martinborough and, especially, Marlborough. Not that I disliked the Mt. Difficulty wines at all, some of which also had great names, like the Roaring Meg line, which is named for a river and other local landmarks which are in turn named after a favorite prostitute of the region's gold rush era. We went to our hotel to rest and regroup, and so Kevin could arrange a taxi to take us to Arrowtown, where we had reservations at Saffron restaurant. The taxi was important as Bill and I considered it imperative that Kevin have wine with his dinner. In Arrowtown we started at a really charming bar called The Blue Door, which is owned by chef and restaurateur Peter Gawron, who also owns Saffron and an Italian restaurant in the same alley. I drank a Monteith’s Ale from the South Island’s West Coast, Bill had a Manhattan, and Kevin had a Hoegaarden, with which the bartender did a fascinating thing: He poured it into a glass, keeping the mouth of the bottle submerged just below the surface of the liquid, slowly raising it so that the beer emptied into the glass but the foam stayed in the bottle, then he lifted the bottle out of the glass, letting the foam stream out and form a nice head on top. I’d never seen that before. Then we went on to Saffron, which has an eclectic menu including what seemed to me to be fairly traditional New Zealand dishes — or at least dishes with ingredients most Kiwis would be accustomed to, like venison with beet and juniper, which Kevin ordered — but also hard-core Asian dishes, like my Shanghai-style smoked fish, lightly poached and then crisp-fried with soy sauce, ginger, garlic and spring onion on lettuce and fried rice. That in and of itself wouldn’t be interesting, except for the fact that Kevin’s venison dish tasted very traditional and Western, and my dish was full-on, full-flavored Chinese. Bill's trio of curries tasted very much like they might in India and Malaysia. I don’t know of any restaurants in the United States that can pull that off, or that even try to. The lighting was bad for taking pictures, and amateur flash photography of food is generally ugly, so I tried to use the company camera’s image stabilization feature to take a picture in the dark. The result’s weren’t great, but I’ve seen worse. Let me know what you think. To the right is a picture of my fish (which was hapuka, the local word for grouper). For appetizers we all had white bait prepared three ways: lightly sautéed, flash fried and made into fritters. Then I had duck and coconut rice fritters with lemon grass, kaffir lime leaf, eggplant and plum sauce. Obviously we drank local Pinot Noirs with dinner, starting with a 2005 Mount Maude and then a 2006 Cornish Point. For dessert I ordered an Eton Mess, which is meringue broken into chunks and served with berries and whipped cream. Bill had a crêpe with bananas and caramel and Kevin had deep-fried marmalade. My journey through New Zealand continued with a flight from Blenheim to Christchurch in the region of Canterbury. We stopped by Hinton's, near the airpot, for lunch, where I had baked Parmesan-crusted lamb cutlets on a potato galette with a spinach, pancetta, lemon and spiced carrot salad and a mint jus. This is as good a time as any to point out that the United States has no monopoly on gargantuan portions. I was served three double lamb chops (i.e. six ribs). My galette must have been eight ounces of potato, and believe me they didn't skimp on the pancetta. It was a lot of food, something of which I was particularly aware since on the way to the airport we'd stopped by a butcher shop and I had my first steak and kidney pie. It kind of reminded me of a Jamaican beef patty, but without the spice and with a comforting earthiness that I think came from the kidney. 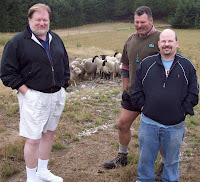 So I was full as Kevin drove us to Middle Rock in the Canterbury high country, where we visited the sheep farm of Bruce and Lyn Nell. We tooled around the 50-year old farm, which was given to the family as part of a land grant program to World War I veterans. The Nells have 8,000 Corriedale sheep, a dual-purpose breed, which means they're used for both wool, suitable for baby blankets (young Corriedale lambs have wool as fine as 23 microns, although 27 microns is the norm for more mature animals) and meat. The lambs are born in October, weaned in February and sold throughout their first year. Those kept for wool and breading are shorn once a year, in September. Commodity lamb in New Zealand is normally "harvested" (a polite way of saying "slaughtered") before they're a year old, which is interesting, because I'm told that many New Zealanders contend that hoggets have tastier meat. Hoggets are sheep aged between one and two years. Their meat would be more flavorful but somewhat tougher in structure — meatier if you will — than lamb. At two years, they're mutton. At the end of the tour we met dog trainer and entrepreneur Bernie Oliver, whom rugby fans, which, it seems, includes every one of the four million people in New Zealand, will be interested to know is the uncle of Anton Oliver, the former captain of the All Blacks, New Zealand's national team. Bernie showed us how his dogs herd sheep. He sent a little one out to round up a small herd, which the dog did by running around the periphery of the field they were in and then running back and forth in sort of a shrinking arc that motivated the sheep away from him and toward us. At least that's what I think he was doing. Then we visited with Bernie and the Nells in the Nells’ home, drinking coffee and snacking on tan bars — a sort of blondie — while Bernie told us of one of his entrepreneurial plans. He’s selling prepared cuts of Merino hoggets at a farmers market. Now that's interesting because Merinos are wool sheep, not meat sheep. Mr. Nell explained that sheep with fine wool, which Merinos have, also have finely grained meat, giving them a desirable texture. But it also means that they put on bulk slowly. So pound per pound (or kilo per kilo, as it were) Merinos are uneconomical for meat, but they should certainly taste good. After our visit, Kevin drove Bill and me to Terrace Downs, a high country sporting resort, with a golf course, fishing and, we were told, spectacular views of the mountains. It was a foggy, overcast day, though, so I'll have to take their word for it. The folks at New Zealand Trade & Enterprise had rented a house for us for the night. In its kitchen, Graham Brown was making dinner. Graham is a chef for the Cervena venison folks, among others, and I met him back in 2001, the last time I was in New Zealand. I even wrote a profile of his son, Hamish Brown, who was then the chef at the George Hotel in Christchurch and now is working in London. 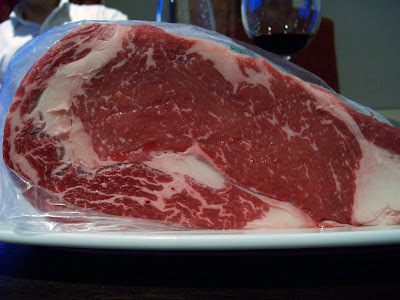 Joining us for dinner were two representatives from Five Star Beef, which, contrary to New Zealand custom, fattens its cattle on grain (mostly barley and wheat, but also corn silage) for export to Japan. They're exploring options for exporting to the United States. Graham roasted that with Yorkshire pudding and served it with a Shiraz and white pepper sauce and Kikorangi blue cheese. We drank a 2002 Pegasus Bay Cabernet-Merlot with it. Pegasus Bay is in the Waipara region in Canterbury. Graham insists that Waipara will be New Zealand’s next big wine region, as many of the country’s best winemakers have set up shop there. Waipara is not to be mistaken for Wairarapa, on the North Island, which is where our 2005 Paddy Bothwick Pinot Noir was from. We had that with venison that Graham had cured in salt and raw brown sugar and then smoked it with Red Zinger tea. He seared it rare, sliced it and served it on mesclun with baby arugula (which New Zealanders call “rocket”), orange, blueberry, fried parsnip, walnut and walnut oil-raspberry vinaigrette. Then out came a bottle of Kim Crawford Sauvignon Blanc, from Marlborough of course, to be drunk with Graham's whitebait soufflé in phyllo tart. Then came the beef, along with side dishes of vegetables and potatoes, also seasoned with white pepper, which Graham loves. I mean, he loves it. He swears by it. 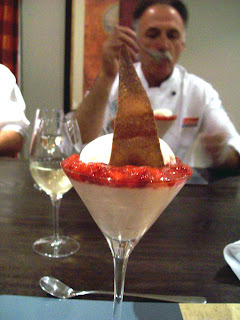 Here's a picture of Graham, enjoying his rhubarb fool, topped with mashed strawberries, and ANZAC tuile and whipped cream. The tuile is made with ANZAC cookies, a staple food for Australian and New Zealander soldiers at the World War I battle of Gallipoli, at which British commanders used those troops as cannon fodder against the Turks. Graham crushes up the cookies into a batter, spreads it thinly on a silicon baking sheet and cooks it into a tuile. 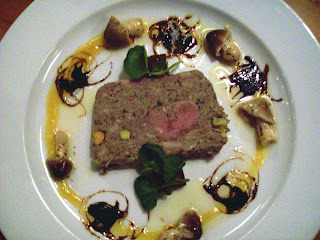 We ate it with a Grove Mill Late Harvest Gewürztraminer, from Marlborough. Here’s one more picture, just for fun, of Bill and Graham. After learning everything we were going to learn about green-shell mussels, and more about what New Zealand creations the Australians took credit for, we checked into the Hotel d’Urville in Blenheim, the largest town in the Marlborough region, which is of course known for its wine in general and its Sauvignon Blanc in particular. I’ve been to wine growing regions before, but none with such vast vineyards. Marlborough is no narrow valley like Napa. It has wide, flat plains planted with rows and rows of vines that seem to stretch on for miles. It’s really spectacular. We checked in to the Hotel d'Urville, one of those quaint hotels where each guest room has a different theme (I was in the New Zealand room, with shells, Maori artifacts, and banners from different sports teams — I assume mostly rugby). We met with Kevin Parish and John Grant downstairs for drinks before dinner, but Bill and I got there early and had a chance to peruse the restaurant’s menu, and it filled us with mild dread, so convoluted did each menu item seem. The lamb had a chocolate mint sauce. I had a cocktail made from a vodka infused with feijoa, a popular New Zealand fruit, followed by a local brown ale, and then we repaired to the dining room. 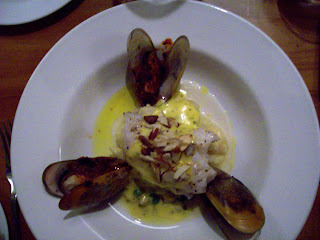 That was followed by lemon peppered “Chatham Island” blue cod resting on a shrimp and green pea risotto, trio of steamed mussels (by which they meant three mussels) with a tarragon, almond and orange hollandaise and Prenzels lemon oil. Surprisingly, it was all quite tasty. 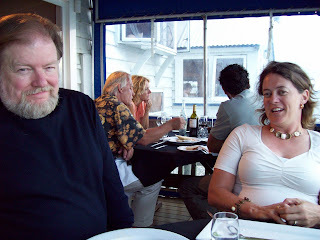 We drank a couple of Marlborough Pinot Noirs: a 2006 Astrolabe and then a 2006 Clayridge. Marlborough is a fairly new region for Pinots, with more established vineyards on the North Island in Martinborough and Wairapara, and down south in Central Otaga, but I think the Marlborough ones are my favorite. Kevin later showed me a picture of a blue cod, which doesn’t resemble a cod at all, although it is a bottom feeder and so it has a similar diet. John says the blue cod fishery, unlike the North Atlantic cod one, is still robust, and fishing there is easy. Over dessert (I didn’t photograph the dishes, but one of them was a “chocolate vision," comprised of a chocolate terrine sponge and Clayridge Excalibur chocolate mousse quenelle in a chocolate teardrop with a chocolate sorbet and citrus reduction), and a 2006 Konrad Sigrun Noble Riesling (also from Marlborough), John told us about the mutton bird, or titi, a delicacy of the Maoris on the small islands south of the South Island, appropriately called the Mutton Bird Islands. Only Maoris of the Naitahu tribe are permitted to go there. Mutton birds migrate there all the way from the Bering Strait to nest. They leave their hatchlings and return home, and then the Maoris catch the birds and eat them. “So these birds migrate across the world to breed and then you eat their children?” I asked. “It’s sustainable,” he said with a shrug. And it probably is. New Zealanders are serious about that stuff. The hatchlings are about the size of quails and are sold brined in buckets for about NZ$10 per bird. The next day, after a visit with Blair Gibbs of Spy Valley Vineyard, a medium-sized winery that produces about 130,000 cases of wine annually), we went on to the Blenheim airport, where the story of my visit to New Zealand began with me running into MJ Loza. It was great to see him. With him was Brad Farmerie, the chef of Public restaurant in New York. 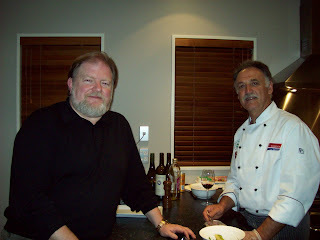 I later learned that he had been cooking at The Dinner Series at Waterfall Bay. He was headed to Auckland to do a demonstration of Venison dishes for writers at Cuisine magazine. He looked well. The early part of a press trip can be sketchy, because you have no idea who these people you’re traveling with are. Have you been trapped with lunatics? With angry curmudgeons? Were your organizers incompetent, setting you up in accommodations with plumbing problems in mosquito-infested swamps? You don’t know. On a trip with just two guests, well, it could be bad. But it became clear pretty early on that this trip would be a good one. Bill King comes across at first as a quiet man. Not quite gruff, but no chatterbox. Once he decides he’s interested in something, however, he becomes completely engaged and is open about his opinion while still being kind. As a chef, he’s in the hospitality business and from that comes a fundamental warmth, which is desirable in anyone you’re likely to spend time with. On top of that, we seemed to be looking for similar things on the trip: Information about the food and wine of New Zealand without much fuss. This all became clear pretty early on, as we drove from Nelson to the little town of Havelock in Marlborough (it turns out there also is a Havelock in Hawke’s Bay, on the North Island; obviously that’s a different one). The few thousand people who live in Havelock are at the center of New Zealand’s green-lip mussel industry. From here boats ply the Marlborough sounds, tending to the farms of mollusks suspended from ropes below the surface of the water. We met Sam Hobson, John Grant and Sigrun Steinhagen of Aotearoa Seafoods, a company owned by 3,500 families from four different Maori tribes. They have many business interestes, including wine and tourism as well as mussel growing and processing. Nicola, Bill, Kevin and I boarded a little boat with Sam, John, Sigrun and a pilot whose name I think was Graham, or possibly Graeme. Nice guy. There we learned about green-shell mussels, as New Zealanders call them, as well as how Australians claim things that are really Kiwi, including Russell Crowe, the Split Enz and their successor band, Crowded House. I amused my hosts by disparaging Australians generally and decrying their shabby character as we visited the mussel farms. In truth, I like Australians, and most of the ones I have met are of very fine character. But playing on people’s irrational prejudices is a sure way into their good graces. I think they knew I was kidding. You should have heard what I told them about Aucklanders. Pompous lummoxes, one and all (I was joking then, too). 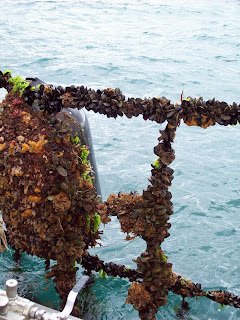 The mussel farms are networks of ropes suspended from posts below the water. The mollusks attach to the ropes as tiny little guys the size of a grain of sand. At first they are put along with seaweed into a mesh sock that is stretched around the ropes. As they get bigger, they are shaken lose, put into new socks and put on new ropes. They spread out and grow, and eventually the mesh socks rot away, giving them more room to continue spreading out and growing. We happened upon one of Aotearoa’s harvesting vessels and were invited onboard — we were traveling with the crew’s bosses, after all — and wandered around, asking questions, to the polite amusement of the crew. I wondered a little about what they were smiling at. “Blue collar snobbery,” Bill explained later: They found it funny that we hadn’t worked an honest day in our lives. Kevin took this picture of me on the harvesting vessel. We returned to our own little boat and had lunch. We started with a few raw mussels, which John pulled out of the water and pried open. Green-shell mussels are bigger than mollusks that we’re accustomed to eating raw. I enjoyed them anyway. Bill told Sam and John that they probably would sell the mussels better in the United States if they harvested them at smaller sizes. 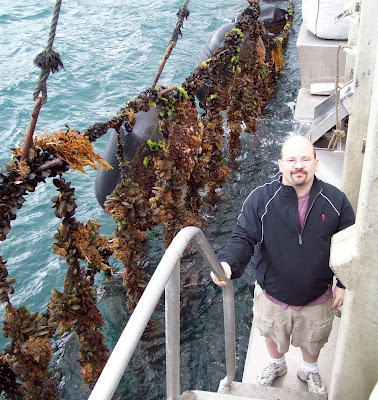 Green-shell mussels traditionally have been low-budget items in the U.S., sold at Chinese buffets and the like, but Sam, John, and presumably anyone else exporting their mussels, are aiming for a higher priced market. This is a common theme that will come up frequently as I recount my journey. But for now, I’ll end this entry with a picture of Sam (on the left) and John. Farm-raised king salmon. Who knew? The next day, February 11, we met the man who was to be our guide for the rest of our trip, a Canterburian by the name of Kevin Parish. Canterbury is the region of New Zealand most similar to England, by all accounts that I’ve heard. Its largest city, Christchurch, also is the largest city on the South Island. Kevin flew up to Nelson on Monday morning to meet us at New Zealand King Salmon, the largest producer and supplier of farm-raised king salmon in the world. Now I thought that was interesting, because I had no idea that king salmon was farm-raised. To my knowledge, all of the farm-raised salmon in North America is Atlantic salmon, and king is one of the five species of the Pacific Northwest (the others are sockeye, coho, chum and pink). 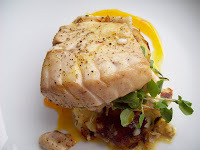 [I have since learned that king salmon also is being farm-raised in British Columbia]. Bill King, the McCormick & Schmick’s guy who was my co-traveler on this trip — and who to my knowledge is not related either to king salmons nor to Bill McCormick, the restaurant chain’s co-founder and, perhaps not uncoincidentally, the current US ambassador to New Zealand — had told me earlier that this year’s season for wild Pacific salmon was looking bleak. Fishing for salmon on the continental U.S. West Coast and perhaps well into Canada might be severely restricted due to low numbers of fish. The imminently sustainable salmon fisheries of Alaska seem to be doing fine, however. 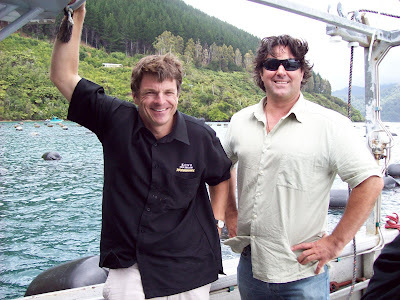 Still, the possible dearth of wild salmon in North America might make the farm-raised kings of New Zealand particularly appealing this year. The folks at King Salmon told us that their species of choice was harder to raise in farms than Atlantic Salmon because it was more delicate, and thus more difficult to harvest, and because its feed-to-bodyweight conversion ratio (1.6-1.7) was higher. It’s also harder to process because it can’t be pin-boned by machine. Their particular breed originated as wild New Zealand kings, which were brought from the American West Coast, probably for sport fishing. Now they spend about a year in a hatchery and then, when they reach a weight of about 150 grams (a third of a pound, more or less), they are transferred to pens spread out in waters around New Zealand, far enough away from each other that their keepers don’t need to treat them with antibiotics or vaccines because they’re not near enough to other fish farms to risk infection. The salmon spend between 12 and 18 months there. When it’s time to harvest the fish, they are sedated by having oil of clove poured into the water. Then they are caused to flow into another area in which carbon dioxide is pumped into the water, stopping their brain function, although their hearts continue to beat. Then the fish are harvested one at a time, their gills cut so they bleed out. They are gilled and gutted through the night and then processed. The feed, like much farm-raised fish feed, comes from South America and is mostly fish protein, although New Zealand King Salmon is experimenting with using vegetable oils and vegetable proteins. But they don’t expect more than half of the oil to be vegetable oil, because any more than that and the salmon run the risk of having a lower content of those heart healthy omega-3 fatty acids that everybody loves. They harvest about 6000 metric tons of salmon annually at individual gilled-and-gutted body weights between 3.5 and 4 kilos (so, 7.7 to 8.8 pounds). (For gross body weight, add 12 percent). Just under half of that is exported, mostly to Japan, but about 10 percent of the harvest goes to the United States, mostly fresh-chilled. The company breeds some fish to grow quickly and others to grow slowly, so they have continual harvest. Some of the fish are sent whole to Christchurch for export, but those that are to be further processed rest for a day to go through rigor mortis. Then they are steamed for a few seconds to kill bacteria and loosen the skin. Next they are brined or dry-cured with salt and sugar, depending on what their customers want, for as long as their customers want, and then they’re smoked, filleted and further processed. Excess fingerlings are sold as food for penguins, orcas and other attractions at zoos, aquariums etc. The existence of local, farm-raised salmon apparently has had a fairly dramatic effect on dining habits of New Zealanders, just as it has on Americans. In both countries salmon used to be a luxury, and now it’s an everyday food. In fact, the NZ King Salmon folks told me that they are enjoying domestic growth of 20 percent annually. Their output is growing by just 10 percent, so they are starting to focus more on value-added stuff. This is the obligatory hairnet photo that people very much enjoy taking when visitors tour their processing plants. 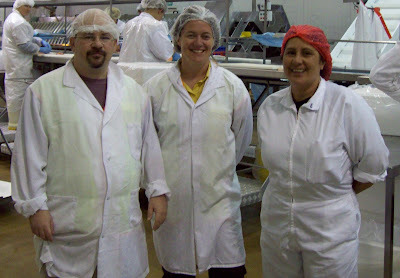 Pictured here are me, Nicola Mitchell and Tanya from New Zealand King Salmon. I don’t actually have a sponsor, but I do have a job, of which this blog is a part, as an editor at Nation’s Restaurant News. Another part of my job is making podcasts, which are now available on iTunes, and can be reached by clicking here. MJ Loza was kind of angry with me today when he saw me in the Blenheim airport. MJ was one of my hosts and guides the last time I was in New Zealand. Usually you get along fine with hosts on press trips, occasionally you develop a seething hatred for them, and every once in awhile you become friends. MJ and I were friends, and if I were to fly nearly half way around the world back to New Zealand, it would seem reasonable that I’d pick up the stupid phone and call him. He’s right, of course, but my schedule here is quite full. I won’t even have time to pop over to Wellington to see my old friend from my Bangkok days, Daniel Eaton. Then again, I mean, I could have extended my stay, or asked Dan to hop over to Nelson. It would be an imposition, but if he were in, say, Washington, D.C., I’d pop down from New York to see him. I can’t imagine asking a friend to do that for me, though, or for MJ to be terribly interested if I’m in his country, even if he had made sure to contact me the last time he was in New York. At any rate, I’m the guest of New Zealand Trade & Enterprise, which in its effort to raise the profile of all foodstuffs from this Land of the Long White Cloud — the translation of its Maori name, Aotearoa — invited me and Bill King (favorite color: blue), corporate chef of the McCormick & Schmick’s chain, to check the place out. Nelson, on the northern edge of the South Island, and just a quick trip from Wellington, which is on the southern tip of the North Island, was our first stop, on Sunday. We were supposed to spend the afternoon sailing around Tasman Bay on a catamaran, but the weather was drizzly and overcast, and instead our hostess, Nicola Mitchell, took us to Mapua Wharf, where we spent some time in a restaurant called Smokehouse, drinking a 2006 Neudorf Sauvignon Blanc and snacking. We split a fish platter, and Bill had a calamari salad. I had a cup of seafood chowder with fish, mussels, scallops and prawns. The fish platter, on the left, had two fish I’d never had before — terakihi, on the far right of the picture, behind the mussels, and warehou, on the far left — along with hake (hiding behind the bread), mussels and salmon. They tasted a lot like light, warm water fish, although the warehou had big, meaty flakes, something I would learn more about at dinner. Then we sampled local ice cream. Bill tried fruit flavors while I went for indigenous kitsch. I got two scoops. One was Jaffa, which is orange and chocolate and which I assume is named for the ancient port city south of Tel Aviv now known for its oranges, although Jaffa also is an unkind nickname for someone from Auckland (just another you-know-what Aucklander). I also had a scoop of Pinky Winky, named for a candy bar of that name with strawberry, chocolate, marshmallow and caramel. The sun came out, and to pass the time before our dinner at The Boathouse Café, we drove along the coast, enjoying the view of gentle waves splashing along the beach. 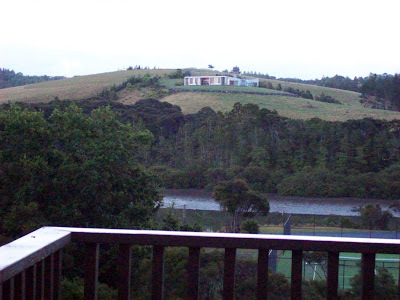 Nelson itself has many pretty rolling hills, something I didn’t notice until the next day at breakfast, which I had on the second floor of our hotel, the Rutherford, named for physicist Ernest Lord Rutherford, a Nelsonian and the first man to split the atom. Here’s a picture of Nicola and Bill at dinner. I started with half a dozen Pelorus oysters, which I would learn the next day came from Pelorus Sound, not far away, off of nearby Havelock, which you will learn about shortly. 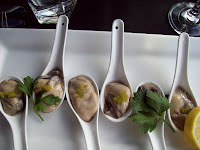 Interestingly, the oysters were removed from their shells and served in those soup spoons you get in Chinese restaurants, topped with wasabi tobiko. My main course was more Warehou, served with crushed rosemary-infused potatoes, zucchini linguini — which is to say zucchini shredded into the shape of linguini and cooked — and smoked fish mousse. The plate was drizzled with saffron vanilla reduction. Here it is, on the right. The zucchini linguini was called courgette linguini, as is the custom with zucchini here — Kiwis prefer that squash’s French name to its Italian one. Warehou is a meaty fish with big flakes and reminds me quite a bit of Chilean sea bass. I think it has mass-market potential. We drank Te Mata Elston Chardonnay with that. Nicola’s main course was scallop ceviche served with, among other things, hemp oil, which we all agreed tasted like marijuana. I hope you haven’t missed me too much. I’m in New Zealand learning many fascinating things that I was hoping to have shared with you already, but they’re keeping me pretty busy here, and the blogging muse is lying low. So I’m afraid you’ll have to wait a bit to learn why the warehou might be the next big fish, or why you might want to consider eating the meat of wool sheep rather than meat sheep, especially if they're hoggets, or what region some of the biggest wine makers here are looking to next. There has been sun and fog, happy reunions and slightly angry ones. Oh, and for New Yorkers who want to know where their chefs are, Brad Farmerie is here in the Land of the Long White Cloud, too. I hadn’t seen him in a short-sleeved shirt before, and so I didn’t know he had tattoos. For readers who enjoy chain restaurant trivia, can you tell me what former chain restaurant executive is now the United States’ ambassador to New Zealand? That and so much more lies ahead. The funny thing about having dinner in Queens this evening was that I was supposed to have been in Las Vegas. I had been contacted a few months ago by the American Society of Interior Designers to speak on a panel at the IntersectWest conference there. Apparently someone had seen me speak on a panel the previous May about foodservice trends at HDExpo 2007 and wanted to duplicate that very panel. Now, I don't know why one group of designers would want to put on the same panel that a design magazine put on less than a year earlier. Surely it would attract a similar crowd and look boring, repetitive and kind of stupid. But I figured I could update my PowerPoint presentation with new and fascinating information, and clean up the layout a bit as the HDExpo 2007 attendees, while drinking with me later, had praised my information but disparaged the layout, so that even if the ASID looked silly, I would not. Today's Wednesday, and by Monday I had finished all the work I needed to do for my regular job at Nation's Restaurant News. I'd had to back out of a Super Bowl party that I really would have liked to go to (thrown by my excellent colleague Milford Prewitt) to finish my work, but I did it. I had set up nice meals to have in Las Vegas, and was ready to leave the following day. I e-mailed my contacts at ASID and asked if they needed anything else from me, and I asked at what hotel I was staying. I got a reply, from the person who had replaced one of my contacts, with a press release attached. The release said that IntersectWest 2008 had been canceled. The release was dated January 23. Hadn't I heard? I wondered how I would have heard if they hadn't told me, since, being a food writer, I am not generally informed about the scheduling of design conferences any more than I'm informed about the price of tungsten or the latest innovations in printed circuit board assemblies. Since it hadn't been rescheduled, they were releasing me from my contract. Wasn't that nice of them, releasing me from my contract? The contract had said basically that I would show up and that they would pay for my flight and lodging. My new contact also told me I would be reimbursed for any out-of-pocket expenses I'd incurred. I thought of flying to Las Vegas anyway and billing ASID for my flight and lodging. But instead I went to Jet Blue's web site and learned that I could cancel my flight for just $40. So I billed ASID for $40. I was told it would be taken care of, and I believe it. Today I got an e-mail from another one of my contacts, whom I'd also asked if they needed anything else from me and wondering where I was staying, saying she wasn't sure what I was asking about to. I said that explained why she and everyone else at ASID had neglected to tell me that IntersectWest had been canceled. Her answer was priceless and exemplifies what's wrong with America: "I didn’t neglect to tell you about Intersect/West because I wasn’t working with that and had no idea it was cancelled." You see, that's the wrong answer. The right answer is, "I'm sorry." Joe DiStefano from Gothamist said something to me the other night that I always like to hear. He said he liked my work. "We should go out for Thai food," I said, because Joe lives in Queens, where we New Yorkers keep most of our Thai food, and because ordering Thai food is one of the things I do best. If people like what I write, I want to order Thai food for them. Joe liked the idea of this, because there was a place in Elmhurst, Ploy Thai, that he wanted to check out. Actually, he'd checked it out, and was dismayed that they ignored him when he said he wanted the food to be spicy. Pehaps he would have better luck if someone ordered it in Thai. It turns out it means gem, or jewel. Good to know. Joe was a little bit disappointed that the specials on the board were no longer just written in Thai, but had English translations, too. But he didn't know that one of the specials, yam plah dook foo, or fluffy catfish salad, was an unusual (for New York) and fun dish to have, and that som tam pu, or green papaya salad with mud crab, was an unusual modification (for New York) of the som tam with peanuts (and ideally dried shrimp), that was more common both in the US and in Bangkok. It was a variation from Thailand's northeast. "Isaan," Joe said, so I'd know that he was no neophyte when it comes to Thai food. Isaan is what Thais call the Northeast. So we ordered those items, along with a couple of standards that are good markers of quality in a Thai restaurant: stir-fried pork with basil and green curry, which we got with chicken. I insisted in Thai that they make both of the salads spicy. "Ta mai pet, mai arroy," I said -- If it's not spicy, it doesn't taste good. They brought out the papaya salad first and waited for us to taste it to make sure it wasn't too spicy. It was, actually, but it's what we were looking for. I think flames might have shot out of poor Joe's mouth. I'm not sure. I have a pretty high threshold for capsaicin-induced pain, but I tasted the danger and avoided anything that looked like a chile. It reminded me of eating som tam in Thailand. "Perfect," I said, and she brought out the rest of the meal. Here's what struck me: They didn't pretend that Thai salads are like white people salads, to be eaten as a separate course. They brought every dish out the instant it was ready, as one does in Thailand. It had been so long since that had happened in New York that I had forgotten it was possible. Joe's reviewing the place for Gothamist, so I'll leave him to it. It should be posted in a few days. I think Sloan “Allergic Girl” Miller gets up earlier in the morning than I do. She certainly wrote her blog entry about Padre Figlio earlier than I wrote this one. It was nice to meet her in person; we had merely e-corresponded before. She’s pretty, and looks a lot healthier than I’d imagined. We spoke about allergies, but also about other things, like Firefly, which I think was the best TV series of all time, although I just got turned onto it a few weeks ago. She has a friend who worked with its creator, Joss Whedon, who is my hero. Padre Figlio is a brand new Italian restaurant by the people who owned Da Antonio. For their opening party they had a buffet spread that I picked at, but mostly I drank Chianti and Cabernet Sauvignon and chatted with Arlyn Blake, Francine Cohen, Joe DiStefano — a Queens expert who works for Gothamist and others — and a few other regulars of the New York restaurant opening world, and Allergic Girl. It was a good time. I didn’t eat much, though, so I walked around the corner to Soba Totto. The full menu is in place now, and I snacked on cucumbers with red miso and a skewer of grilled shishito peppers before diving into a hot bowl of yamakake soba. Yamakake soba has a root in it that the Japanese call nagaimo or yamaimo, and that often is translated into English as mountain yam or Japanese yam. It's a tuber, but more like a watery potato than a yam, with one big difference: It has a slimy, slippery texture that the Japanese think is just a wonderful quality in food and that Americans think is, uh, slimy and slippery. And viscous. Like saliva, but a little thicker. Or mucous. But really, if you know that's what you’re getting, you can steel yourself and be ready for it. Or at least I can. So they brought what I think was a raw quail egg to the table, along with a cup of puréed nagaimo and a bowl of hot soba. I was to add the egg to the purée and pour it into the bowl. Which I did. The soba had little bits of yuzu zest in it, which I didn't expect. The broth with the added nagaimo was a little slimy, which I did expect, and I figured I’d mention it again so you know what to expect when ordering yamakake soba. No one wants that kind of a surprise in noodles. Did you know that New Orleans now has 80 more restaurants than it did before “the storm” (as locals call Katrina)? I don’t know if that’s true, but it’s what Thomas Wolfe, executive chef of Wolfe’s in the Warehouse in New Orleans, said. 2) We’ve been forgotten, neglected, and we need help! I suspect both have elements of truth. I also learned last night at the James Beard House that the next time I go to New Orleans I must have roasted oysters at Drago, near the airport, and also make the 25-mile trek across the bridge to Trey Yuen for the best Chinese food in America. The last bit of advice was from Lynn Howard, a native of New Orleans who once was a physician but now is an international equities trader and art dealer. She met her husband Chris Howard here in New York, I think at a rugby game (excuse me, rugby match). I find that it is practically a law of nature that if someone says something is the best, it’s usually below average. But Lynn and Chris seemed bright (he’s a biochemist and art dealer) and nice and I’ll try to get to Trey Yuen next time I’m in New Orleans. The Howards were at the Beard House because Lynn is an old, old friend of Thomas Wolfe, who was cooking there last night. And who do you think was photographing the event but Jamie Tiampo, whom I’d just met the other night? He looked very cute and serious. Yesterday I had lunch at Gilt, which was hosting an event thrown by a spice company announcing its 2008 flavor forecast, centered around 10 pairings that it has declared to be the flavors of 2008. The lunch was developed by the spice company's corporate chef along with Gilt executive chef Chris Lee and Michael Schulson, who used to be the executive chef at Buddakan in New York, but left to do a television show called Pantry Raid. Now he’s working on opening a Japanese-oriented restaurant at Borgata in Atlantic City, in the space where Susanna Foo’s restaurant used to be. I parked myself at a middle seat of a long table and was soon joined by Susan Westmoreland of Good Housekeeping, which is always a treat. We didn’t end up talking much, though, because after Michael finished talking about the food, he sat on the other side of me and we talked about food in East Asia and sort of gossiped about New York chefs. Mostly, he avoided giving me too much information about what other chefs were doing as I needled him for information. He did sort of nod and shrug in ways that indicated where I should follow up, so that’s what I’ll be doing. We also talked about seasonality. One of the flavor combinations Michael had to work with for the lunch was lemon grass and lychee. But Lychees are a hot season fruit — available in Thailand in April and May, for example — and of course yesterday was the last day of January. So although canned lychees are available, Michael made a culinary statement by pickling the lychees. I thought that was a good way of serving what he needed to serve while still highlighting seasonality. I chatted with Chris a bit after lunch. He seemed well. Apparently he was responsible for the cardamom "caviar" in the fizztini (see below), which were little green cardamom-flavored spheres made by adding sodium alginate to a flavored liquid and dripping droplets into calcium chloride solution. That’s probably the molecular gastronomy trick to go the most mainstream, unless you count using transglutaminase to hold cuts of meat together. I had 8 p.m. dinner reservations at Bagatelle on Wednesday, but I got there early, so I lingered at the bar and sipped Sauvignon Blanc as I got to know the bartender, Giuseppe, a friendly chap from Calabria who came to New York, met a woman, got married, has a kid, seems happy. I think Clark Mitchell showed up right on time and ordered what I was having, which is of course a very quick way to get a drink. He later switched to a gin Martini — with onions, so I guess it’s technically a Gibson. He said he has made that his regular drink, a slight switch from his previous regular drink, a gin Martini with a twist. Clark had been invited to dinner at Bagatelle separately, but he passed the invitation on to some underlings at Travel + Leisure and went as my guest instead. He brought along, at my request, a copy of an article he wrote on Gstaad (Clark's the guy in the mostly red jacket, looking very sporty). He handed me the magazine and then went to say hello to his underlings. I’m so proud that Clark has underlings now, not that I had anything to do with it, but it’s nice to watch people grow. The menu at Bagatelle, which just opened in Manhattan’s Meatpacking District, is mostly simple French bistro fare, so Clark and I had mostly simple things. He ordered crudités and a filet with Béarnaise sauce, and I had leek-filled truffled ravioli and a steak au poivre. We drank Pomerol with it.